Dirty Princess (one of my favorite stores!) has a group gift out, and the group is free to join! It comes with Omega, TMP, and Slink appliers. Also in this photo is the free hair from Lelutka and the group gift eyes from IKON. Lamb has some new hair out as a group gift! Head on over and grab it! Now! Go! Hurry!! It's sooooo cute! Go try your luck! Hope you get the ones you want! 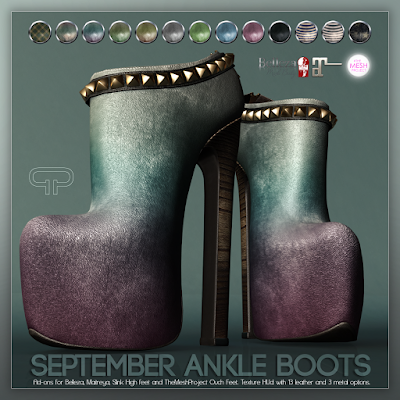 Also, today only, for Fifty Linden Friday, they have these cute ankle boots! I love Fridays! !